The shores of Waterville is indeed a special place for me personally. On one side you have a wonderful town where Charlie Chaplin statue resides centre stage Home to a lot of famous visitors the likes of Tiger Woods, Mark O Mara and the late Payne Stewart, Maureen O Hara (From The Film of The Quite Man) just to name a few! And the Other side is Waterville Golf Links. This relaxing links course opens up to a Magical place that will never want you to leave ! Each Hole designed by the great Eddie Hackett received an update by Tom Fazio bringing Waterville into the world rankings of Links Golf. By the time you're have played nine you may think it doesn't get better than this but here is where Waterville comes alive and grabs hold of your thoughts and imagination to bring this links to its needs and help you make Par ! Waterville Golf Links is not a course you want to play once in your life but again and again. The Fazio project will proceed in concert with a major coastal protection programme and will be completed in 2006 without interruption of regular season play. (see changes) In addition, Waterville House is undergoing its own renovation highlighted by a Fazio designed practice facility, a state of the art health facility and enhancements to the latest angling assets. These projects will insure Watervilles future and reputation as Ireland’s premier golf destination. Payne Stewart first visited Waterville with friends from the PGA Tour in 1998 to begin preparation for the British Open. He returned again in 1999 and joined the membership of Waterville Golf Club. Later that year during the Ryder Cup he accepted the Honorary Captaincy of the Club for the year 2000 - the final golf title of his distinguished career. With this dedication Payne Stewart becomes part of Ireland and an adopted son of Waterville - a mystical place in the Kingdom of Kerry. The earliest structured golf at Waterville has been tracked back to 1889 when it came under the umbrella of the extremely active Waterville Athletic Club. It was a formalised part of the life of the village by 1900, when becoming one of the first clubs to be affiliated with the Golfing Union of Ireland. A modest nine-hole layout occupying for the most part the flat eastern section of the present championship links, it was operated by the Athletic Club for, and on behalf of, the Commercial Cable Company. Over the next fifty years the club membership fluctuated with the demand for cable communication, however in the 1950s more advanced technology replaced this demand and ultimately the club ceased to exist. The Links lay dormant throughout the 1960s waiting the arrival of the Irish born American, John A. Mulcahy who had a vision to build the most testing golf links in the world. Ireland’s foremost links architect, Eddie Hackett, joined Mulcahy and his close friend Claude Harmon, a past Masters champion and head professional at Winged Foot Golf Club and between them designed a course fit to be ranked among the best. The terrain was ideal, and after exhaustive planning and work, the course and its new clubhouse opened in 1973. The original nine holes were reconfigured and expanded to create today’s front nine. Its layout was designed as a contrast to the more rugged and exposed back nine, yet it quickly introduces the player to the complexity and beauty of links golf. The testing begins early at Waterville with the first hole named “Last Easy”, and ends with the challenging and scenic “O’Gradys Beach”. The course can be stretched to over 7,300 yards but players should not be intimidated as several tees come in to play on every hole so all standards of golfers can enjoy a game here.During the next 15 years under the leadership of John A. Mulcahy and its famous long driving professional Liam Higgins, Waterville enjoyed great popularity. Numerous professional tournaments were played, and over forty of the world’s greatest champions from Sam Snead to Nick Faldo experienced the Links. In 1987 Waterville was sold to a small group of Irish Americans. They loved the game of golf and set about carrying on the history and tradition of the Links. The Links combined with Waterville House, the Directors 18th century four star residence to create one of the finest golf and fishing resorts in the world. The Waterville Fishery, and in particular Butlers Pool next to the House, are famous for salmon and sea trout. Great champions continue to find their way to Waterville – Els, Furyk, O’Meara, Stewart and Woods to prepare for the 1998 British Open which was then won by Mark O’Meara. Prior to the 1999 Open O’Meara, Stewart and Woods were joined by Appleby, Duval and Jansen, all of which became members of Waterville. Later that year at a ceremony during the now famous Ryder Cup in Brookline Massachusetts, United States team member Payne Stewart accepted the Captaincy of Waterville – the last golf honour he would receive before his tragic death. Today a life sized bronze statue pays tribute to his Captaincy and his special relationship with Waterville. 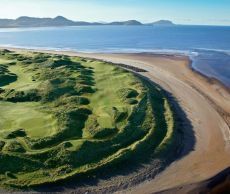 Waterville Golf Links Green fees are 170 Euros a person for 2013 season High Season. Or conbine both course with Ballybunion and Waterville Golf Links Vacation Packages.